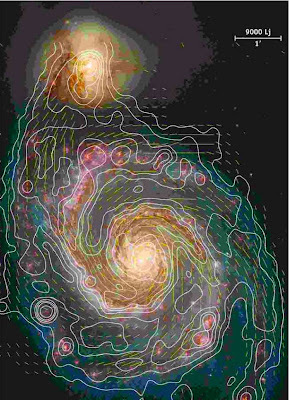 In July this blog reported on Magnetic Galaxies formed early in the Universe's history (photo above.) Now astronomers have found that a galaxy formed 6.5 billion years ago has a magnetic field 10 times stronger than our Milky Way. As before, the discovery was made using radio astronomy. The world's biggest steerable radio telescope in Green Bank (West Virginia) directly measured the field of protogalaxy DLA-3C286. The results appear in the October 2 issue of NATURE. These discoveries challenge old theories of galaxy formation. Every galaxy ever examined contains at its centre a supermassive Black Hole. This singularity's rotation causes huge magnetic fields to form in its vicinity. If the field billions of years ago was this strong, the Black Hole must have already been large. Rather than growing along with the galaxy, the Black Hole was supermassive from the start. More and more evidence indicates that supermassive Black Holes are primordial, formed from quantum fluctuations grown huge by expansion of the Universe. Size of a PBH is limited by a horizon distance within light's reach. Previously scientists thought that Primordial Black Holes were tiny. Supermassive Black Holes within galaxies, including ours, are more indicators of a changing speed of light.